I’ll never forget the night of the big fire on Broadway. I don’t recall the date exactly, but I believe it was September 1989. That’s the date on the negative sheet I have of photos of the aftermath, so I’ll go with that for now. For me it started more as a dream than a real event. I remember waking up in the small hours, there was a noise from outside that I thought was a gunshot, then another, a slow, angry sequence of loud cracks echoing in the night. Coming out of sleep it was a strange and unnerving feeling that something wasn’t quite right. The noise had also woken my parents, and for a moment there was confusion as to what the noise could be. Then there were sirens, we knew something was wrong and eventually found our way out into the street. I’ll never forget the sight as I walked out into the middle of Stacey Road (many other residents were already standing there) and looked towards the source of the noise. There between the backs of the Broadway shops and the Roath Conservative Club at the corner of my street was a wall of flame rising high into the sky. The old BBC building on Broadway was on fire. It really was like something out of a war film, like the old black and white footage of the blitz in London only this time in full colour and about 100 metres away from us – close enough to feel the heat of the flames. The building was a big old church that rose above the other buildings on Broadway, and as we watched was sending flames even higher into the air. It didn’t look good, the police cordoned off the end of our street and we watched as a lone fire-fighter on mechanical platform pumped water in silhouette against the fire. The loud cracks I’d heard were the timbers of the building popping as the fire took hold. One policeman remarked that a woman had called in an emergency believing the noise to be gunfire, so I wasn’t alone in initially reaching that conclusion. As the fire continued its work, other loud bangs were heard as gas cannisters within the building ignited and exploded. The gas canisters were landing in the back gardens of adjacent buildings, and as the fire and chaos continued it became obvious that it was more than just the church that had gone up. But what of the building that we watched disappearing under a wall of flames? Originally it was the Broadway English Wesleyan Methodist Chapel, an imposing building at the Clifton Street end of Broadway, opposite the junction with Cyril Crescent and the Roath Conservative Club (itself an impressive inner city building.) From what I’ve found online it was built in 1879, designed by architect William Gilbert Habershon of Newport. Initially built for Christian worship the building had a number of other uses during the 110 years it stood, ending its life returning to religious use as a centre for Islamic worship. In between these religious eras and for a good few decades it was most surprisingly a TV studio for BBC Wales. We always referred to it as the Broadway BBC to differentiate it from the BBC building 100 metres away on Stacey Road (which we simply called The BBC). To give the building its official name when it was a studio, it was BBC Wales Studio A (and the smaller Studio B). I believe production ceased there in the late to mid 1970s, after which it was deserted for a while and then it used as was a carpet warehouse and store, and then in the mid 1980s it became the Central Mosque and Community Centre up until the point it was destroyed. Amongst the highlights in the documentary was footage of Peter O’Toole performing at the studio, footage of a Dennis Potter play and stories of the jokes the technicians played on each other. I hadn’t known the studio pumped out numerous live drama shows to the whole UK during the 1950s and 1960s, which was a real surprise. It gives me pleasure to think that such a familiar and nondescript local landmark had such a remarkable star-studded history. I’ll take a tiny digression here. When I watched the show it was quite a surprise to see the actor Kenneth Griffith sat in the waste ground on the site of the old building, just a 100 yards or so from my old front door. Why? Well, I spent the best part of a year living in his old house on Church Park in Tenby! It made it feel like a very small world with him being so close to my old family home. But back to that night and the sense of uncertainty as the air hung full of smoke and the rumours and the worries about the possible human cost of the fire began to circulate. It was a worrying time but eventually the fire-fighters were able to bring the blaze under control. However, it wouldn’t be until the next day that the true extent of the fire would be revealed to us. Thankfully, no-one died – but according to the press the next day there had been a couple of near misses. A number of people in adjoining buildings on and behind Broadway had been evacuated as the fire spread which was just as well given how far it did. I heard stories of near misses as a result of those exploding gas bottles, some of which landed very close to people fleeing the fire and I recall another person telling of a wave of flame that blew up over their back garden wall, narrowly missing them as they stood and watched. How no-one died in the fire really is surprising given its extent and intensity. As it became safe enough to get close to the junction to see the damage caused by the fire, we saw it wasn’t just the BBC that had been destroyed, it was also a number of adjacent properties. From memory there was part of the carpet shop next to the church, an often used convenience store and Prosser’s Chemists which had also been gutted. The heat had been so intense that cars on the other side of the road had caught fire and the plastic sign on the shops opposite had melted down the wall. It would be a while before Broadway was open for traffic again at that end, due to the fire, the demolition and then the clean-up. I can’t recall the name of the small convenience store that was there, but I remember it hadn’t long been taken over by a young and politely friendly family who’d been working hard to make a go of it, given the local competition. We’d sometimes talk when I went in there about life on Broadway and any other stuff. I can only think that it must have been devastating for them and the other business owners to see their livelihoods destroyed like that. I don’t know what became of them after the fire, but I was thankful they’d got out unscathed. In fact, I think it was a real blow to the character of the street, as those buildings had stood for a long time and fit in well with a number of the grander buildings at that end of Broadway. 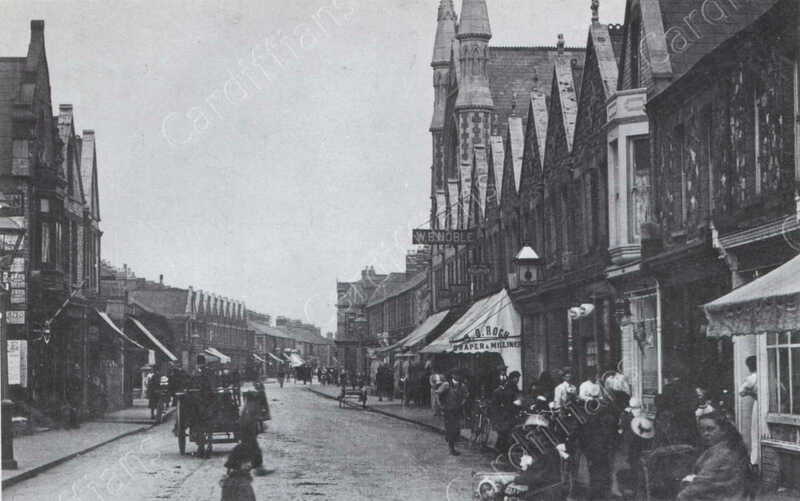 You can see them in 1912 in this photo over at the excellent Cardiffians site. Also of note in the 1912 photo is the changes made to the BBC building in later years with the removal of the spires on the two columns at the front. Inevitably, there was talk about whether the fire had been accidental or not. I can’t remember if it was ever investigated or if anything happened as a result but I suspect not. Suspicions were raised locally as a number of rumours circulated about it being an insurance job or intentionally started, but as ever with these things, rumours are just rumours unless there’s something to back it up. I don’t know in this case if there ever was evidence or a legal case, but it’s no surprise that the building was one of many in the locale that once past an easy-to-maintain state of repair became a victim of a mysterious fire – like the old CWS Biscuits factory / Leo’s building on Moorland Road and more recently the Splott Bingo Hall to name two. It’s a real shame that such grand buildings fall into neglect and end up going out like that, but hey, money. Eventually in its stead some bland flats were built which really didn’t fit in with the surrounding buildings at all and stick out like a sore thumb, but that’s progress for you. The street never felt the same with those buildings gone. The chapel and its past uses are now but a memory. I have many pleasant memories of it, all of which are from the outside. I never once set foot inside and saw what the interior held. As well as its familiar external presence, I also recall it being an occasional haunt for another local legend, the man that we knew as Kung-fu Eddie. I believe he might have gone by another name elsewhere in the city, but you know him if you’re of a certain age and spent any time driving around the inner-city. Eddie was the one often seen at traffic lights with his top off trying to fight the cars. I’d see him sat on the front steps of the chapel looking a bit worse for wear – sometimes the cars (or their drivers) got the better of him. I’d stop and talk to him and ask after his welfare – it was fifty / fifty how that went but he could be funny as hell when the mood took him. I think I might have photographed him once on those steps, but if I did, the negatives were either lost or were not worth printing. Him, like the Broadway BBC have sunk deep into the memory and local history. Below there’s a short clip from the Crystals and Cat’s Whiskers documentary that showed the devastation (originally a Wales Today news report?). The annoying zoom-in effect is theirs, and whilst it’s not brilliantly clear, it gives a good idea of the scale of the destruction and the damage to the adjoining shops. I’m not sure if the demolition began the next day or if there was a couple of days reprieve whilst they waited for the embers to die down and made sure the fire was truly out, but I know it was quite quickly done after the fire. Sadly I’d not had the wherewithal to take photos on the night of the fire – but I took a few as the demolition of the church began, which can be seen below. A wide view taken from Cyril Crescent as many local bystanders watch the work. A close up of the demolition, most of the main window arch still remains. Another wide view from the midway down Cyril Crescent. Another view to the right of the building – the shops to the right seem to be demolished by this point. Another close up of what remains of the roof and the window structure. Workmen look on as the demolition continues. Another view of the demolition from the pavement by the Roath Conservative Club. A view to the right of the building and the fairly brutalist extensions that were made to the building. Another view of the work and the police incident room. Smash, another part of Broadway’s unique character hits the deck. Hello,it was September 1989,i know this as i was living in Sapphire St right at the back of the carpet shop/mosque.My next door neighbour Bob was banging on our front door at about midnight to warn us about what was happening at the rear of our house,the Fire Brigade pulled hoses through our house to get to the back of the fire,we were taken in to the police station at one point as the Brigade were worried that the blaze had got into the roofs in the street, we were moved again to the STAR centre on Splott rd for the rest of the night.My car was destroyed during the blaze,I was asked to move it by the Brigade to give them better access,we all heard a high pitched whistling noise coming from inside the mosque it was large propane gas cylinders heating up!The Brigade did not know the gas cylinders were in the building as they did not have permission for the cylinders to be in the building. the Fire crew came running out followed by a huge explosion the back wall of the building landed on my car destroying it. Over the next weeks we saw the goings on from our rear bedroom window as the fire was finally damped down and the owners of the carpet shop ran on to the sight between the excavators looking for the shop safe? My wife was interviewed by the BBC for news report about the fire,we were all invited to go to Adam St Station to see a display about the fire my Son and I had a ride on the lift platform giving us a fantastic view of Cardiff. What a night to remember that was. Thanks for all that info Laurence, it’s really good to hear another person’s recollections of the night just to check that I wasn’t misremembering things. Sounds like it was really dicey from that side of the building, and what a treat to go up on the lift like that! Yes it was getting quite dicey in Sapphire St as the Fire Brigade did not know what was happening at the rear! Someone had to go into Broadway to tell them about the situation,that was why they put the hoses through our house to get to the fire in the carpet shop which was at the bottom of our garden.Before thy arrived Bob and I had forced entry into the part of the mosque where the Iman was living as we could see a light on and we did not get an answer when we were banging on the door.We searched the house but found it empty? The Fire Brigade said that it was the biggest blase in Cardiff since the Second World War. I remember waking and from further down Broadway looking up. You could see the church roof glowing over the top of the house on the bend opposite Roath labour club. I think we were woken by sirens and my dad took a look. He said it was nothing and I think the fire brigade left, only to return a short time later. There was talk that something was shoved through the letterbox of the carpet shop which started the blaze. Also the story in the echo of the chemist braving to go back into the blazing chemist to save some special medication for a local child. David weren’t you Stacey road pupil?? Maybe my year or one above. I was a Stacey Road pupil, I finished there in 1983 to go to Willows.